If you've voted or will vote for Mitt Romney or Tommy Thompson, you're either an idiot, a racist, or you're just plain selfish. Think I'm wrong, prove me wrong. With far too many drinks in me, I've said this to several Republicans over the past month. Guess what their response was? Their best answers were lies told by Tea Baggers. Everyone I talked to wanted policies that are far more aligned with Barack Obama and Tammy Baldwin than Mitt Romney or Tommy Thompson. Unfortunately, I wasn't able to convince any of these Republicans for at least one of the 3 reasons. If you're rich, I can see why you would vote for Mitt Romney or Tommy Thompson. They'll give you tax breaks and make it easier to screw your workers for more profit. 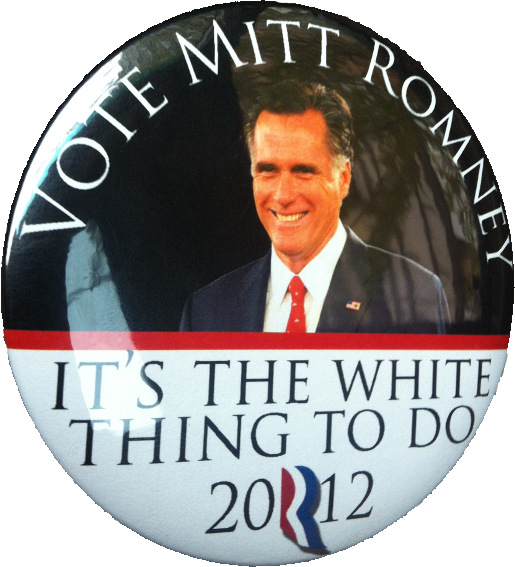 If you're racist or a bigot, I can see why you would vote for Mitt Romney or Tommy Thompson. 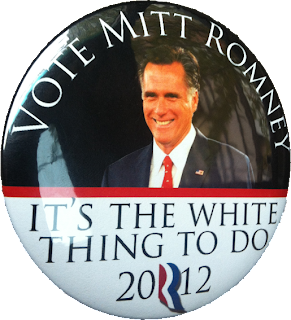 Just one example, this button being sold at Mitt Romney campaign rallies. If you're poor or middle-class, young or old, there's no good reason for you to vote for Mitt Romney or Tommy Thompson. Their policies have been shown to have a negative impact on people like us by many non-partisan organizations and by the 8 years of the Bush Administration who tried the same policies. Any time Mitt Romney or Tommy Thompson says we're they're priority, they're lying through their teeth. One only needs to look at their policy recommendations and private statements. A lot of poor and middle-class voters vote for Republicans based on abortion. But that's absolutely unpatriotic, as our Constitution declares a required separation of church and state. No one has the right to impose their religious beliefs on anyone else, and that's exactly what you expect by trying to place extreme limits on abortion. The only reason Republicans support limiting abortion is because they know you'll vote against your interests to vote for them. If you're not rich or a bigot, why would you vote for Mitt Romney or Tommy Thompson? Because you've been bamboozled by some of the greatest salesmen in the world. You may not really be an idiot, but you're definitely ignorant. Don't want to be called an idiot, then be smart and don't fail the rest of us. There are people who call themselves Republicans but don't fall into one of these 3 categories. However, those Republicans aren't voting for Mitt Romney or Tommy Thompson. Think I'm wrong? Prove it. The lines are wide open.